The airlines of the S7 Group became leaders in punctuality among the airlines operating flights from the Moscow Domodedovo Airport. The Domodedovo Airport monthly rating states that at the end of January 2014 the airlines of the S7 Group demonstrated the best results in punctuality performing the most number of flights without deviations from the schedule. S7 Airlines operates flights to 114 destinations in 25 countries of the world. The Domodedovo Airport is the airline’s main hub, where S7 Airlines offers its passengers convenient connections between different Russian cities and to cities of the Commonwealth of Independent States, Eastern and Western Europe. The airline’s leadership is the result of smart fleet management, high level of aviation equipment maintenance and close coordination with all the services of the Domodedovo Airport. S7 Airlines performs regular flights to countries of the Commonwealth of Independent States (CIS), Europe, the Near East, South Asia and countries of the Asia-Pacific region. 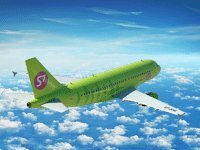 S7 Airlines has one of the newest and most modern aircraft fleets on the Russian air transportation market. “Siberia” Airlines has the widest internal route network in Russia, created on the basis of three air transport hubs in Moscow (Domodedovo), Novosibirsk (Tolmachevo) and Irkutsk. In 2007 the company received an official IATA Notice of Record into the IOSA (IATA Operational Safety Audit), becoming the second air carrier in Russia to have successfully passed the full international audit procedure for compliance with these operational safety standards. S7 Airlines is one of the most reliable airline companies in Russia thanks to the use of the latest advances in the international passenger services field, and active development of its own services. S7 Airlines was the winner of the Wings of Russia 2010 National Aviation Award in the “Business Project in Civil Aviation of Russia” category. S7 Airlines has also been winner of the national annual People's Brand/Brand No. 1 in Russia Award. “Globus” Airlines operates regular flights across Russia, as well as to countries of the CIS and Europe. The company was more than once awarded with a Quality Certificate of the Moscow Domodedovo Airport for the punctuality of its flights.